What can we do to prevent abuse or neglect? Keeping Ourselves Safe (KOS) consists of a comprehensive range of child protection resources to help students learn and apply a range of safety skills that they can use when interacting with others. 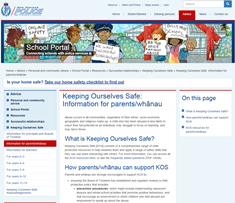 A range of resources are provided for parents and whānau as part of KOS. 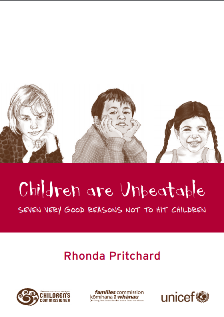 A parenting booklet (PDF, 384KB) (produced by EPOCH New Zealand and the Children's Commissioner) which provides simple suggestions on how to deal with everyday child care and discipline issues. 7 very good reasons not to hit children. 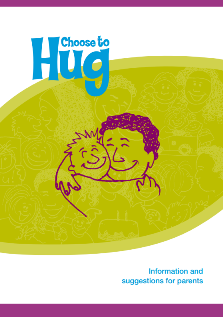 This book (PDF, 500KB) highlights the principles of positive parenting and includes practical suggestions for parents. (Rhonda Pritchard, the Office of the Children’s Commissioner, UNICEF and the Familes Commission). A human baby has the potential to be many things. 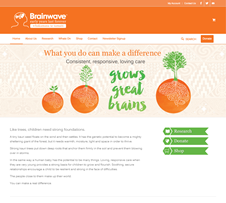 Loving, responsive care when they are very young provides a strong basis for children to grow and flourish. Soothing, secure relationships encourage a child to be resilient and strong in the face of difficulties. The people close to them make up their world. You can make a real difference. This page last reviewed 16 March 2017.